Sonic the Hedgehog (also referred to as SatAM within the fanbase) is an American animated television series created by DiC Entertainment. First airing on September 18th, 1993, the series (along with its lighter, syndicated sister show Adventures of Sonic the Hedgehog) was the face of the Sonic the Hedgehog franchise through the mid-90's. Especially in America, characters such as Princess Sally Acorn and Rotor Walrus became just as familiar as Sonic and Miles "Tails" Prower, even if they were never featured as characters in the games. The show Sonic the Hedgehog revolves around the exploits of the title character and the rest of the Freedom Fighters as they go up against the evil tyranny of Dr. Robotnik and his nephew, Snively. As detailed in "Blast to the Past," Robotnik was once known as Warlord Julian, who had served under King Maximilian Acorn (the ruler of Mobotropolis) during a conflict known only as "The Great War." With the war won, King Acorn orders the dismantling of the army, and prepares to change Julian's title to Ministry of Science. Unbeknown to him, Julian and his nephew have already plotted a takeover of the kingdom, and overnight transform the peaceful Mobotropolis into the mechanical wasteland known as Robotropolis, named after Julian's new moniker. 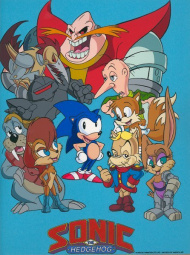 Though the Freedom Fighters are aware of other groups fighting against Robotnik, it is not until Princess Sally reunites with her father briefly (Robotnik having trapped him in an alternate dimension known as The Void along with its discoverer, Nagus) that she learns of the other groups, given a list by her father. Among them are the Wolf Pack, who aid the Freedom Fighters in a plan to defeat Robotnik once and for all. While in the finale of the series Sonic and Sally believe they have won out in the end, the emergence of Snively and a pair of glowing eyes prove otherwise, creating a cliffhanger that would ultimately never be followed up on. After the success of the first Sonic the Hedgehog game, SEGA of America was more than ready to expand the character into other forms of media to capitalize on their success, and broaden his appeal. It was DiC Entertainment who acquired the rights to make the series, having already produced such video game-related shows as The Super Mario Bros. Super Show, The Legend of Zelda, and Captain N: The Game Master. Their first attempt at creating a Sonic the Hedgehog series was what ultimately evolved into Adventures of Sonic the Hedgehog, a more light-hearted series that was based on humor and slapstick action. When presented to the executives at ABC, they were unhappy with the tone and the quality of animation, asking DiC to retool the concept. Reruns continued to be aired in the United States on the USA Network during their "USA Cartoon Express" and "USA Action Extreme Team" morning blocks in the 90's, often being paired with its sister show, Adventures of Sonic the Hedgehog. The show was also aired in Canada on the CTV network, premiering on the same day as in America. However, while the show ended its rotation on ABC in May, the Canadian network continued to air the series through the summer, showing the finale once more on September 2, 1995. In Europe, the show initially aired in the UK on Channel 4, between 1994 and 1996. Years later, UK stations Pop and ITV2 replayed the series in syndication. The first season was also shown on Ireland's RTE Two, and the series was eventually dubbed into Japanese. While the series starred one of the most recognizable characters in video gaming, the show was unable to gain enough momentum to create a third season. Though for a time it was believed the series had been canceled because of a dispute between SEGA, DiC Enterprises and the ABC Network over the selling of animation cells, the real reasons were nothing as trivial. Through nearly all of its run, the show was forced to compete against the biggest children's show of the era, Mighty Morphin Power Rangers. ABC's first response was to change timeslots for Sonic, but Fox Kids responded by moving their series to the exact slot ABC had shifted Sonic to. Being dominated in the ratings, what little hope for a renewal was lost when the President of ABC's Children Programming was replaced at the same time, the new regime having no interest in perusing a third season. Nagus, who was intended to play a larger role in the unproduced season three. The silhouetted eyes featured at the end of "The Doomsday Project" were meant to be those of the wizard Nagus, the void having opened up momentarily during the explosion at the end of the same episode. Even though it was only opened for a moment, Dr. Robotnik inadvertently escapes into the void, so although he survives the blast he immediately becomes tormented by the wizard, the evil dictator's body transformed time and again to Nagus' amusement. Meanwhile, the Freedom Fighters (now called "Freedom Builders") would have begun the process of rebuilding Mobotropolis, Rotor spearheading the transformation. Unbeknown to them, Snively would be sneaking about Robotropolis, gathering intel on the Freedom Fighters and plotting to attack them outright. For a time, Snively is able to place himself in a position of power, proving himself as formidable a foe as Robotnik, if not more so. However, his time as head villain would prove short lived thanks to the efforts of the Freedom Fighters, and in a moment of desperation would free Nagus, Robotnik, and King Acorn from the void. Nagus immediately takes on the title of main villain, using the King as bait to lure Sally in, and making Snively nothing. The first home video releases of the series occurred during the run, three VHS compilations being released in 1994. After those initial three, it would be until 2002 when a second release, "Sonic Boom," would be released in both VHS and DVD formats. Though subsequent releases were planned, they were postponed because of a dispute with Buena Vista Home Video over which company held the rights to release the episodes. It would not be until March 27, 2007 when the entire 26-episode series (along with a plethora of bonus features) was released on DVD by Shout! Factory. The same set, albeit with altered box art, was released in the UK by Delta Music. Complete Series (2007): Contains All Episodes of the series, Ben Hurst interview, Jaleel White interview, Concept art, Deleted or extended scenes. Sonic Boom (2002): Contains five episodes: Super Sonic, Sonic and Sally, Sonic Racer, Harmonic Sonic, and Sonic and the Secret Scrolls. Sonic Boom And Other Episodes (2007): Contains nine episodes: Sonic Boom, Sonic & Sally, Ultra Sonic, Sonic & The Secret Scrolls, Super Sonic, Sonic Racer, Hooked On Sonics, Harmonic Sonic, and Sonic's Nightmare. Sonic, Las aventuras: Vol. 1-6 (2008-9): Contains 25 episodes in six discs, with the exclusion of Heads or Tails. The Fight for Freedom (2008): Contains four episodes: Ultra Sonic, Hooked On Sonics, Warp Sonic, and Sonic and the Secret Scrolls. Super Sonic (2008): Contains four episodes: Sonic Boom, Sonic and Sally, Super Sonic, and Sonic Racer. Sonic Goes Green (2009): Contains four episodes: Heads or Tails, Sonic's Nightmare, Sub-Sonic, and Sonic Past Cool. 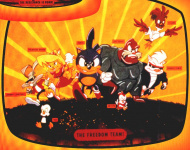 Freedom Fighters Unite (2009): Contains four episodes: Sonic Conversion, Dulcy, The Void, and Spyhog. Sonic Forever (2010): Contains five episodes: No Brainer, Blast To The Past Parts 1 and 2, Fed Up With Antoine/Ghost Busted, and The Odd Couple/Ro-Becca. Doomsday Project (2010): Contains five episodes: Harmonic Sonic, Game Guy, Cry of the Wolf, Drood Henge, and The Doomsday Project. Hooked on Sonics (1994): Contains two episodes: Hooked on Sonics and Warped Sonic. Sonic Racer (1994): Contains two episodes: Sonic Racer and Sonic Boom. Super Sonic (1994): Contains two episodes: Super Sonic and Sonic and Sally. Sonic Racer (2002): Contains two episodes: Sonic Racer and Harmonic Sonic. 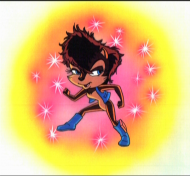 Super Sonic (2002): Contains two episodes: Super Sonic and Sonic and Sally. It is the only Sonic cartoon not to have the Chaos Emeralds involved in the storyline. Articles - Sonic the Hedgehog (TV series) - A collection of magazine articles relating to the television series Sonic the Hedgehog.